Grandfather of Abraham (No. 2), who speaks of him as having lived in Fez. Cabalistic author and commentator; born in Fez about 1570; died at Hebron Nov. 6, 1643. The expulsion of the Moors from Spain brought a great number of the exiles to Morocco, and these newcomers caused a civil war from which the country in general and the Jews in particular suffered greatly. Abraham Azulai, in consequence of this condition of affairs, left his home for Palestine and settled in Hebron. There he wrote a commentary on the Zohar under the title "Kirjath Arba" (City of Arba; Gen. xxiii. 2). The plague of 1619 drove him from his new home; and while in Gaza, where he found refuge, he wrote his cabalistic work "Ḥesed le-Abraham" (Mercy to Abraham; Micah vii. 20). It was published after the author's death by Meshullam Zalman ben Abraham Berak of Gorice, in Amsterdam, 1685. Another edition, published in Sulzbach in the same year, seems to be a reprint, although Steinschneider, in "Cat. Bodl." col. 666, thinks the reverse. Azulai's commentary on the Zohar, "Zohore Ḥammah" (Rays of the Sun), was printed in Venice, 1654. He also wrote: "Or ha-Lebanah" (Light of the Moon), "Ma'asse Ḥosheb" (Cunning Work), and "Kenaf Renanim" (Peacock's Wing). "On the mystery of metempsychosis and its details: Know that God will not subject the soul of the wicked to more than three migrations; for it is written, 'Lo, all these things doth God work twice, yea thrice, with a man' (Job xxxiii. 29). Which means, He makes him appear twice and thrice in a human incarnation; but the fourth time he is incarnated as a clean animal. And when a man offers a sacrifice, God will, by miraculous intervention, make him select an animal that is an incarnation of a human being. Then will the sacrifice be doubly profitable: to the one that offers it and to the soul imprisoned in the brute. For with the smoke of the sacrifice the soul ascends heavenward and attains its original purity. Thus is explained the mystery involved in the words, 'O Lord, thou preservest man and beast' (Ps. xxxvi. 7 [R. V. 6])." 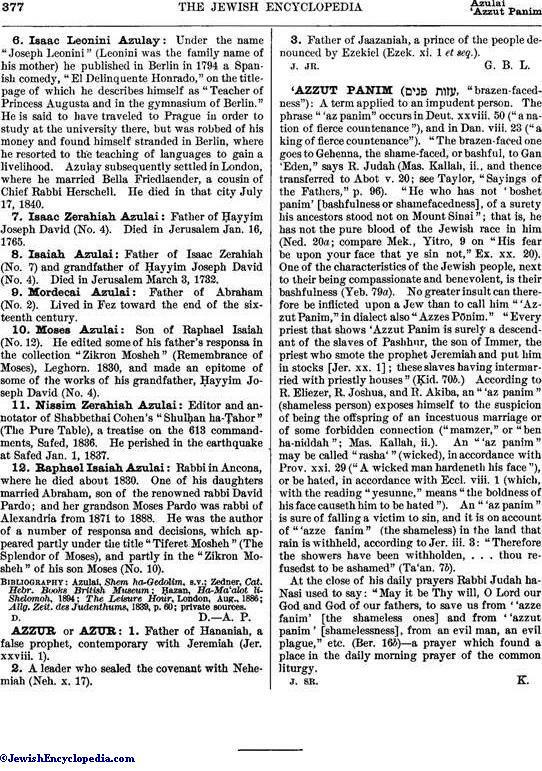 Michael, Or ha-Ḥayyim, p. 12.
called "the illustrious cabalist": Rabbi and author; born in the city of Morocco; died there about 1745. He was popularly supposed to possess miraculous powers. He is the author of a Hebrew work upon the Cabala, "Miḳdash Melek," a commentary upon the Zohar. 4. Ḥayyim Joseph David Azulai: His Early Scholarship. Son of Isaac Zerahiah (No. 7); one of the most prolific of rabbinic authors in the eighteenth century, and a pioneer writer on the history of rabbinical literature; born in Jerusalem about 1724; died at Leghorn March 21, 1807. He studied under Isaac ha-Kohen Rapoport, Jonah Nabon, and Ḥayyim ibn 'Aṭṭar. While in general a type of the Oriental rabbi of his age, a strict Talmudist, and a believer in the Cabala, his studious habits and stupendous memory awakened in him an interest in the history of rabbinical literature and in its textual criticism. He accordingly began at an early age a compilation of passages in rabbinical literature in which dialectic authors had tried to solve questions that were based on chronological errors. This compilation he called ("Some Oversights"). It was never printed. Azulai's scholarship made him so famous that in 1755 he was chosen as meshullaḥ. (emissary), an honor bestowed on such men only as were, by their learning, well fitted to represent the Holy Land in Europe, where the people looked upon a Palestinian rabbi as a model of learning and piety. He traveled in this capacity through Italy, France, Germany, and Holland. On his return to Palestine he settled in Hebron, where his ancestor Abraham Azulai (No. 2) had first settled when he came to Palestine. Joseph David Sinzheim, in a eulogy on Azulai, states that the latter left Palestine three times on his missions, in 1755, 1770, and 1781. His diary and his other works are, however, not clear on this point. In 1755 he was in Germany, in 1764 in Egypt, and in the year 1773 in Tunis, Morocco, and Italy, in which latter country he seems to have remained until 1777, most probably occupied with the printing of the first part of his biographical dictionary, "Shem ha-Gedolim," Leghorn, 1774, and with his notes on the Shulḥan 'Aruk, entitled "Birke Yosef," Leghorn, 1774-76. In 1777 he was in France, and in 1778 in Holland. On October 28 of the latter year he married, in Pisa, his second wife, Rachel; his first wife, Sarah, had died in 1773. Noting this event in his diary, he adds the wish that he may be permitted to return to Palestine. This wish seems not to have been realized. At all events he remained in Leghorn, occupied with the publication of his works. Azulai's literary activity is of an astonishing breadth. It embraces every department of rabbinical literature: exegesis, homiletics, casuistry, Cabala, liturgics, and literary history. The last is, as has already been stated, the only department in which he was original. A voracious reader, he noted all historical references; and on his travels he visited the famous libraries of Italy and France, where he examined the Hebrew manuscripts. His notes were published in four booklets, comprising two sections, under the titles "Shem ha-Gedolim" (The Name of the Great Ones), containing the names of authors, and "Wa'ad la-Ḥakamim" (Assembly of the Wise), containing the titles of works. They were, however, so unsystematically arranged that the mass of facts contained therein was of little value until Isaac Benjacob, in 1852, published the work systematically arranged, with copious cross-references. This treatise has established for Azulai a lasting place in Jewish literature. It contains data that might otherwise have been lost, and it proves the author to have had a critical mind, except when touching cabalistic doctrines. By sound scientific methods he investigated the question of the genuineness of Rashi's commentary to Chronicles or to some Talmudic treatise (see "Rashi," in "Shem ha-Gedolim"). Nevertheless he firmly believed that Ḥayyim Vital had drunk water from Miriam's well, and that this fact enabled him to receive, in less than two years, the whole Cabala from the lips of Isaac Luria (see "Ḥayyim Vital," in "Shem ha-Gedolim"). The amount of blind superstition found in his diary and other works is almost incredible in a man of such admirable critical ability; and his liturgical works have greatly helped to make this superstition general. In his diary he notes all the cabalistic recipes found by him in manuscripts, and gives many instances of the miraculous effects of his prayers. In his religious attitude he is a strict rigorist. He discusses the question of early burial, which he recommends chiefly on the ground of the cabalistic doctrine that the delay of burial occasions suffering to the dead, and actually writes: "If it should happen in one case out of ten thousand that one would be buried alive, this would not be the slightest sin; for it was so foreordained in order to avoid the evil that would result to the world from this man or his posterity" ("Ḥayyim Sha'al," i. 25). Azulai's exegetical works are of the same character, being filled with interpretations of numerals and of casuistic methods. Instances of this kind are found on every page of his "Ḥomat Anak" (Wall Made by a Plumb-Line; Amos vii. 7) and in his commentary to the Psalms, entitled "Yosef Tehillot" (To Add Praise), Leghorn, 1794. As a writer Azulai was most prolific. The list of his works, compiled by Benjacob, runs to seventyone items; but some are named twice, because they have two titles, and some are only small treatises. Still, his activity was marvelous. The veneration bestowed upon him by his contemporaries was that given to a saint. He reports in his diary that when he learned in Tunis of the death of his first wife, he kept it secret, because the people would have forced him to marry at once. Legends printed in the appendix to his diary, and others found in Walden's "Shem ha-Gedolim he-Ḥadash" (compare also "Ma'aseh Nora," pp. 7-16, Podgoritza, 1899), prove the great respect in which he was held. Even to-day a great many Oriental and Polish Jews undertake pilgrimages to his grave or send letters to be deposited there. Azulai left two sons, Abraham and Raphael Isaiah (No. 12). Of the former nothing is known. Michael, Or ha-Ḥayyim, No. 868. Noted cabalist; lived at Hebron in the seventeenth century; son of Abraham (No. 2). He wrote "Zera' Yiẓḥaḳ" (The Seed of Isaac), a cabalistic work, now lost. He died at Constantinople, presumably while traveling as an emissary for the congregations of the Holy Land. Isaac had two sisters. One married Benjamin Ẓebi and was the mother of Ḥayyim Abraham Israel Ẓebi, who was rabbi in Hebron (died 1731) and the author of "Orim Gedolim" (The Great Lights)—a treatise on rabbinical law—and of "Yemin Mosheh" (The Right Hand of Moses), glosses to the Shulḥan 'Aruk (The Hague, 1777). The other became the wife of David Isaaci; and their son, Abraham Isaaci (died Jan. 10, 1729), was an eminent rabbi in Jerusalem and the author of responsa entitled "Zera' Abraham" (The Seed of Abraham), 2 vols., Constantinople, 1732, and Smyrna, 1733. (For Key to Names see Following Page. 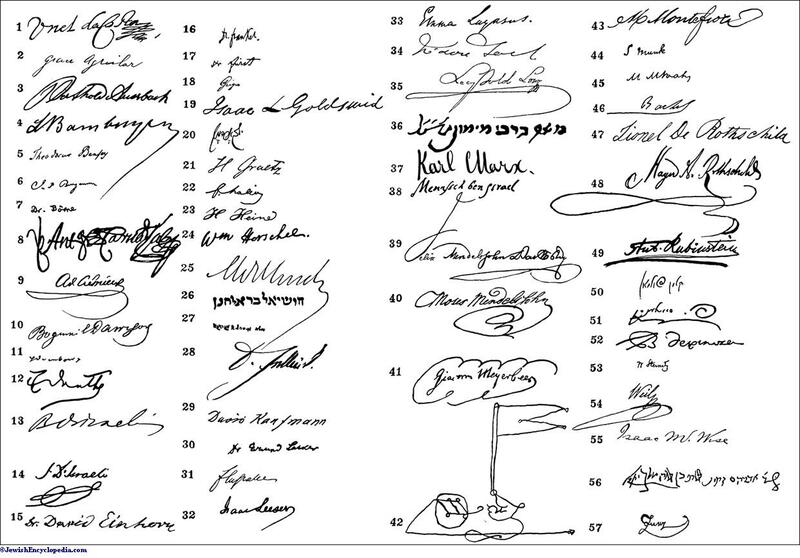 )KEY TO AUTOGRAPHS OF JEWISH CELEBRITIES. Under the name "Joseph Leonini" (Leonini was the family name of his mother) he published in Berlin in 1794 a Spanish comedy, "El Delinquente Honrado," on the titlepage of which he describes himself as "Teacher of Princess Augusta and in the gymnasium of Berlin." He is said to have traveled to Prague in order to study at the university there, but was robbed of his money and found himself stranded in Berlin, where he resorted to the teaching of languages to gain a livelihood. Azulay subsequently settled in London, where he married Bella Friedlaender, a cousin of Chief Rabbi Herschell. He died in that city July 17, 1840. Father of Ḥayyim Joseph David (No. 4). Died in Jerusalem Jan. 16, 1765. Father of Isaac Zerahiah (No. 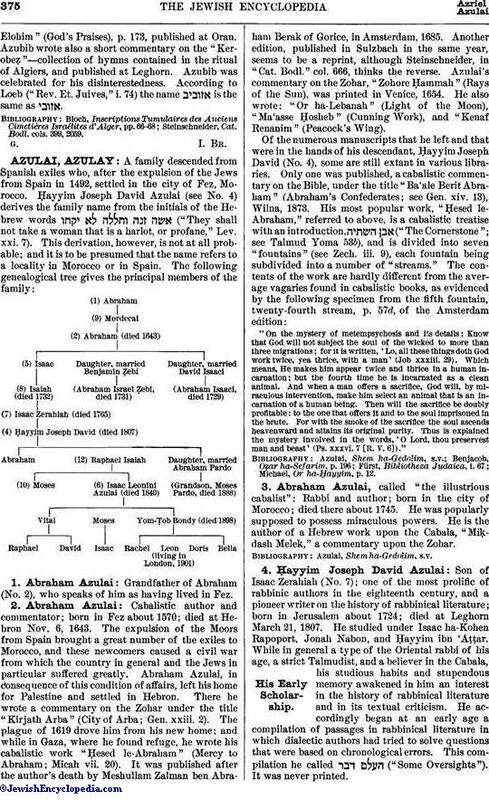 7) and grandfather of Ḥayyim Joseph David (No. 4). Died in Jerusalem March 3, 1732. Father of Abraham (No. 2). Lived in Fez toward the end of the sixteenth century. Son of Raphael Isaiah (No. 12). 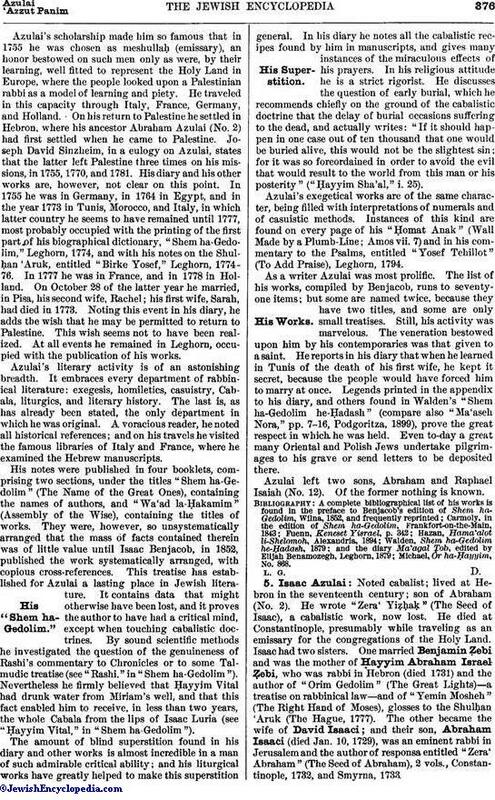 He edited some of his father's responsa in the collection "Zikron Mosheh" (Remembrance of Moses), Leghorn, 1830, and made an epitome of some of the works of his grandfather, Ḥayyim Joseph David (No. 4). Editor and annotator of Shabbethai Cohen's "Shulḥan ha-Ṭahor" (The Pure Table), a treatise on the 613 commandments, Safed, 1836. He perished in the earthquake at Safed Jan. 1, 1837. Rabbi in Ancona, where he died about 1830. 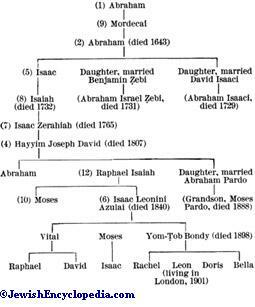 One of his daughters married Abraham, son of the renowned rabbi David Pardo; and her grandson Moses Pardo was rabbi of Alexandria from 1871 to 1888. He was the author of a number of responsa and decisions, which appeared partly under the title "Tiferet Mosheh" (The Splendor of Moses), and partly in the "Zikron Mosheh" of his son Moses (No. 10). Allg. Zeit. des Judenthums, 1839, p. 60; private sources.